From time to time we like to showcase what readers of OrangeTractorTalks get up to with their favorite piece of orange equipment. 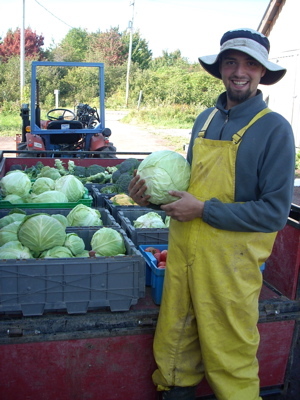 Today, we take a look at Antoine and his organic vegetable farm, Ferme de la Coulee douce located in St-Antoine-de-Tilly, Quebec Canada, a mile away from the banks of the famous St. Lawrence River (click for map on google). Note: Antoine’s site is in French, use google’s translator to convert it if need be. Antoine’s farm, established in 2004, is 5 acres in size and produces more than 30 varieties of organic vegetables – carrots, lettuce, onions, cabbage, tomatoes, fresh herbs, broccoli, cauliflower, peppers, peas – you name it, his farm grows it. He built the farm from the ground up having purchased the raw plot 5 years ago without buildings, improvements, water or electricity. 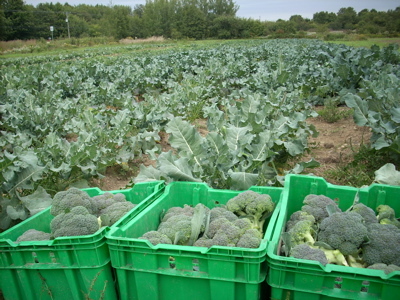 Today the farm supplies fresh organic produce to more than 150 families in Quebec. Antoine's farm produces more than 30 varieties of vegetables - like this brocoli for instance. In the winter time temperatures drop below -22F (-30C) and the ground sees lots of snow – about 20 feet fall on the farm every year. This means his Kubota is putting in overtime hours running a snowblower to clear a path to a few greenhouses on site. 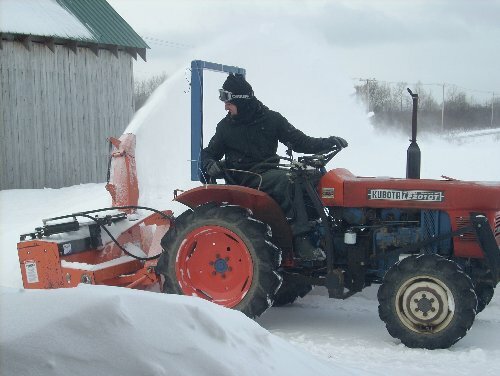 Antoine makes good use of his tractor’s creeper gear to move the heavy wet snow, an engine block heater and the cylinder head decompression function when it comes to starting in those temperatures. The farm's Kubota L2201 earns its keep - snowblowing, rototilling, hauling or running the irrigation system. The farm uses a gray market Kubota L2201 to blow snow, rototill, brush cut and run a water pump off the PTO for irrigation. Other attachments include a seeder, cultivator, weeder and a couple of trailers for hauling the harvest – a very busy tractor indeed. On the technical side – the L2201 is closest to Kubota’s North American L245. Both have the 3 cylinder D1101 engine that generates about 24.5 horsepower at the flywheel and 20 at the PTO. The L2201/L245 is similar to its smaller brother, the L1801/L185 which is a 2 cylinder tractor. Antoine’s tractor is a 4WD but the L2201 was manufactured in both 2WD and 4WD configurations and production ran from around 1975 to 1979. Expanding the existing greenhouses, planting an orchard and creating a windbreak are all in this Kubota’s future. Sounds like Antoine will be busy for a little while to come. We thank Antoine for sharing with us how he uses his Kubota to get the job done! Well done! Discovered it’s a Gray Market Kubota? Relax. Antoine, Where do you grow the burgers and fries to go with all that lettuce? That’s some good lookin’ produce! I notice the L2201DT has been up-fitted with a ROPS and front end loader and the snowblower has an hydraulically operated discharge chute control! NICE! I’ll bet that works better than the old lever and cable system!